writes, from San Antonio, Texas: "I play guitar, bass, keys, harmonica, and the love of my artistic life, the mandolin! I have decades of experience playing bluegrass, blues, country, light fusion, metal, pop, and last but not least, rock, both classic and Top 40. "Besides being able to transfer songs from other instruments to the mandolin, I have hosted jam sessions playing electric guitar & mandolin with (amongst others) Jack Barber (bass from Sir Douglas Quintet) and Urban Urbano (Drummer from Randy Garibay). I usually get some pretty strange stares when I pick up a mandolin for a Judas Priest or Rush tune! 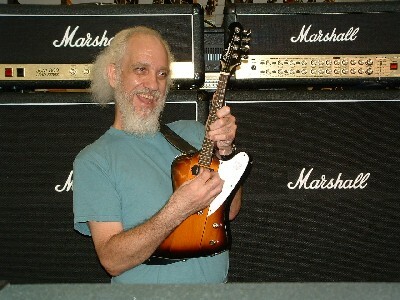 "Speaking of which, I'm currently using my fave, the new Epiphone MandoBird. The first thing I did was cut off those acoustic-rock style strings, and put 9-12-22-32 on her. I use my electric guitar effects (Vox Tone Lab & V-Wah) off an A-B box for the mandos through either a 60-watt Peavey Bandit II for smaller gigs, or my 130-watt MusicMan HD 130 head pushing a Marshall TSLC 212 cab. Talk about a killer mandolin!! "I also use a Fender FM-52E 8-string (I replaced the pickup with a Seymour Duncan Cool Rail), and a Fender FM-60E 5-string that I drop-tune a half step to play with my band (Wolfpak) when the other guitars drop tune."